In the immediate aftermath of yesterday’s horrifying bombing at the Boston Marathon, spectators and runners alike existed in a state of confused panic as law enforcement and rescue teams rushed to the scene to tend to the injured. Fearful of more bombs to detonate along the marathon route, the Boston police quickly instructed bystanders to leave the area and return to their homes and hotels until the imminent danger had subsided. 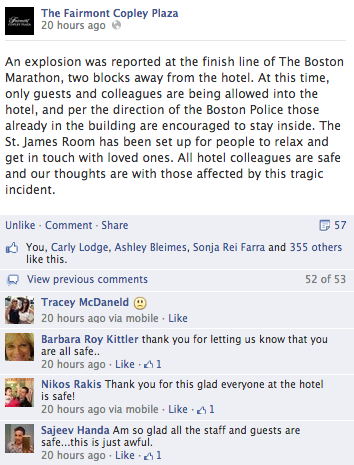 Positioned directly across from the site of the bombings, The Fairmont Copley Plaza took to Facebook soon after the news of the disaster spread to assure followers that the hotel’s colleagues were safe as well as to inform guests about an impromptu check-in station set-up for them to reconnect with loved ones. 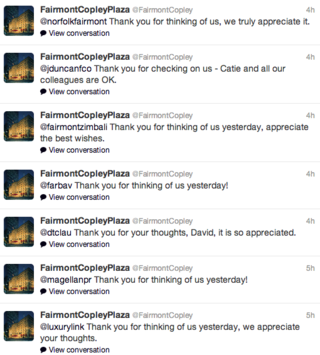 This message was well received by the hotel’s followers, many of whom were relieved to hear about the state of affairs. As messages continued to flood in via Twitter throughout the day and into the next morning, the hotel’s tweeters made a concerted effort to personally respond to each and every tweet sent their way, working hard to ensure that each follower was addressed and thanked for his/her concern. 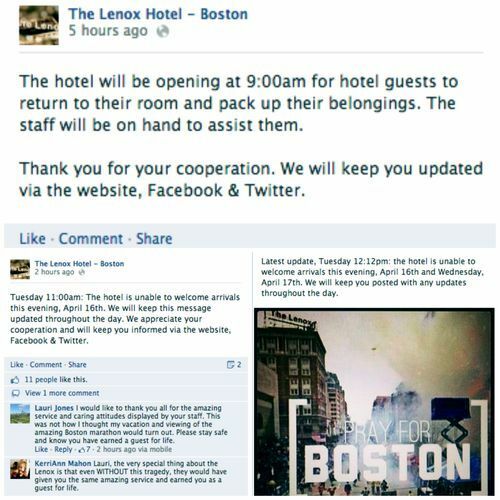 Located in the heart of the disaster scene, The Lenox Hotel was similarly quick to update on its Facebook page, announcing the immediate evacuation of the hotel. Hours later, the hotel continued its transparent communication with updates on when the hotel would be re-opened and answering guest questions regarding their left-behind luggage and how to arrange for alternative accommodations. The Facebook updates continued throughout the next day and were time stamped to assure followers that they were receiving the most up-to-date information available. On Twitter, the hotel followed a similar communication strategy, providing updates intermittently before finally signaling guests to return to the hotel to gather their belongings. 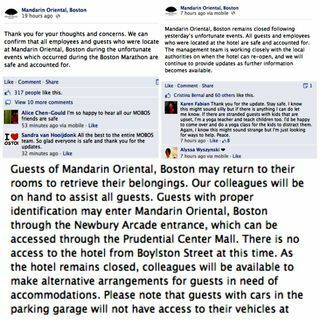 Similar to The Lenox Hotel, the Mandarin Oriental, Boston is located right in the middle of the explosion site and was forced to ask its guests to immediately evacuate. 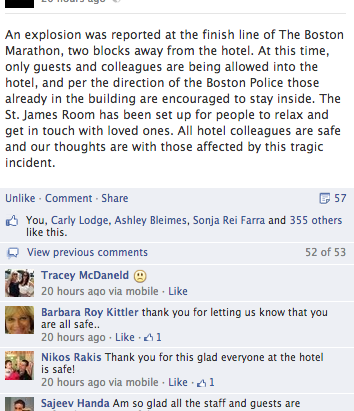 To spread this news, the hotel posted a note on Facebook assuring that, while guests and staff needed to evacuate, everyone was safe. The hotel likewise posted frequent updates on Twitter and used the platform to make significant announcements. What we can learn from each of these hotel properties is that, in the wake of an unexpected disaster, real-time, responsive communication is essential. These hotels were cognizant of follower concerns and swiftly allayed them with direct and transparent messaging. Each property addressed incoming questions and concerns received through each channel promptly and worked hard to broadcast the safety precautions they were taking. Finally, each hotel appropriately suspended any form of communication that was not relevant to the ongoing disaster and avoided any form of promotional or unrelated posts that may have been originally scheduled. While no one ever wants a disaster like this to occur, it pays to have a social media crisis plan in place and be prepared. Clearly, each of these hotels knew what they were doing.